Learn Your α, β, γ's! Who says picture books are just for children? 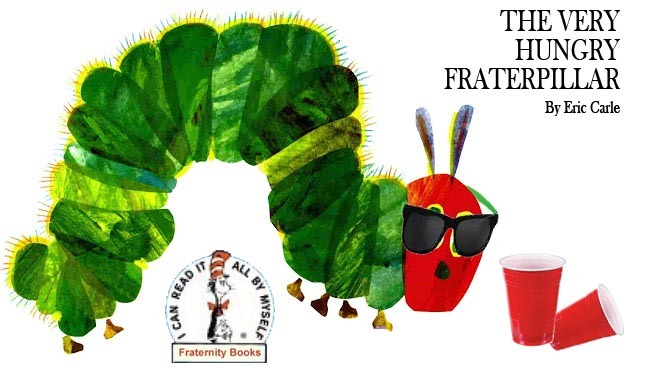 Introducing Fraternity Books: for adults with the reading level of children! *Themes suitable for pledges and brothers alike. The Very Hungry Fraterpillar – Read, or sound out the words of (it’s ok, don’t be ashamed), the touching story of a young freshman working his way through pledging. In the blacklight of the house a little freshman rushes a frat. One Friday night the boy gets a bid and high five! From his double in the Quad came a little fraterpillar. On the first night of pledging the fraterpillar must eat a jar a mayonnaise. On the second night of pledging he must eat two whole onions. On the third night of pledging he must eat three shots of hot sauce. On the fourth night of pledging he must eat four sticks of butter. On the fifth night of pledging he must eat a goldfish but gets a stomachache! The last night of pledging the fraterpillar downs a Natty Light, and after that he felt much better. Now he wasn’t hungry anymore – and he wasn’t a little fraterpillar any more. He was a strong, manly brother! 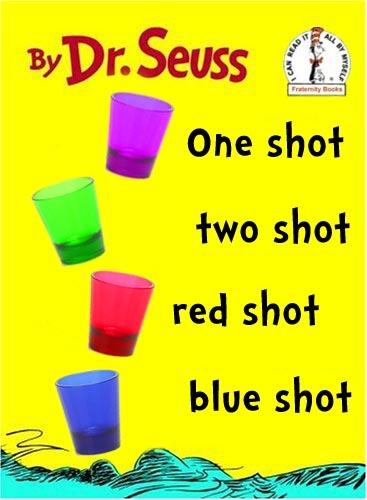 One shot, Two shot, Red shot, Blue shot – Listen to the poetic rhymes of one brother’s tale about the toils of being drunk and male. Some are strong and some are weak. And some are only meant for greeks. Why are they strong and weak and greek? Because one more shot is never wrong. Some are short and some are tall. If you drink the tall try not to fall. From there to here, from here to there, drinking things everywhere. Here are some who like to mix. They mix for kicks to get hot chicks. What a lot of drunken people go by. Some look like two and some like four. Some have six heads and some have more. But I’m so drunk I start to sway. 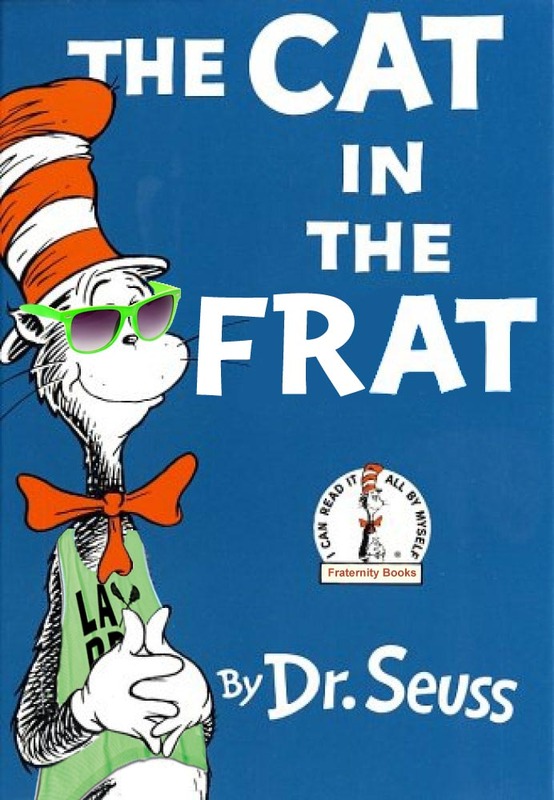 And keep and eye out for our newest addition to the Fraternity Books collection – The Cat in the Frat. Special thanks to Lance Wildorf! Previous All Radio Sketches Online!